Now I have to say goodbye to Barcelona and my heart is bleeding not only a little. 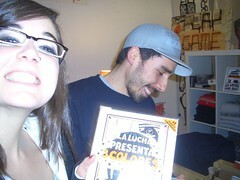 A nice last event was the launch of Venezolanian artists Pian & Hase at the Intro store in Gracia. They produce pop arty, streety and hiphoppy designs. They already worked in many different places all over the world and now really like it in Barcelona. Watch more fotos on Stylewalker@Flickr.